The compact, lightweight chassis is covered with slim bodywork to create a bike that’s agile and fun to ride on a variety of streets – such as city traffic, highway, rural roads and winding roads. The ready-to-ride weight of the 2019 SV650 is just 432 pounds. The high-strength steel, trellis-style frame is key to the motorcycle’s trim and intelligent dimensions. The seat height is just 785mm (30.9 inches) and is the lowest in the 600–800cc street bike class. The SV650’s fuel tank is short and narrow but maintains the same 3.8-gallon (14.5-liter) fuel capacity in both US and California versions. The slim fuel tank and seat joint aid the rider in touching the ground better at stops. The slim fuel tank and seat joint aids the rider touch the ground better at stops. The frame is mated to a steel beam-type swingarm with a straightforward chain tension adjuster system. The 41mm conventional-style front fork has a generous 125mm (4.9 inches) of wheel travel to provide a sporty but plush ride. Link-type rear shock unit has 63mm (2.48-inch) stroke and is tuned for a superb progressive feel and to react efficiently to varied road conditions while still delivering an agile and stable feel. The rear shock’s spring pre-load is seven-way adjustable so you can easily adjust for a passenger or cargo. The front brakes are updated with a pair of fully floating 290mm discs are grasped by new, four-piston Tokico calipers for excellent braking performance. Five-spoke cast aluminum alloy wheels are shod with lightweight, front and rear Dunlop radial tires for sharp handling and good mileage. Dunlop Road Smart III tires are fitted to the SV650 to help with handling and all-around tire performance. With a fresh design, the compact and lightweight instrument cluster has a full LCD display, eliminating motor and needle mechanics. The instrument panel has several features, including a tachometer, speedometer, odometer, dual trip meter, reserve trip meter, clock, coolant temperature/oil pressure indicator, and gear position, plus fuel consumption and driving range data. Well-proportioned, tubular handlebars and mid-set foot controls create a sporting, yet ergonomically relaxed riding position. Tastefully designed, round-shaped headlight is multi-reflector type with 12V60/55-watt halogen bulb. Class exclusive*, 645cc, DOHC, V-twin engine produces strong, torque-rich horsepower while conforming the latest emission requirements. Suzuki Composite Electrochemical Material (SCEM)–plated cylinders reduce friction and improve heat transfer and durability. Both cylinder heads feature Suzuki’s original Dual Spark Technology for greater combustion efficiency, better fuel economy, and cleaner emission. The fuel injection system employs Suzuki’s innovative SDTV (Suzuki Dual Throttle Valve) with 39mm throttle bodies. The secondary throttle valves are controlled by servo motor for smooth power delivery and optimum combustion efficiency. Ten-hole, long-nose-type fuel injectors on each throttle body improve fuel atomization for better combustion efficiency and while reducing fuel consumption. The EFI system employs O2 feedback and a precise intake pressure sensor for optimum combustion efficiency in various conditions and reduces emissions to an incredibly low level. Suzuki’s patented Throttle-body Integrated Idle Speed Control (TI-ISC) eases starting, stabilizes the engine idle speed, and helps lower emissions. The system is compact and lightweight. The TI-ISC on the SV650 incorporates Suzuki’s Low RPM Assist feature that seamlessly adjusts engine speed during takeoff and low-speed running to smooth the power delivery and to help eliminate the possibility of the rider stalling the motorcycle. Advanced, transistorized ignition control programming helps maintain more precise spark timing to the four iridium, long-life spark plugs. 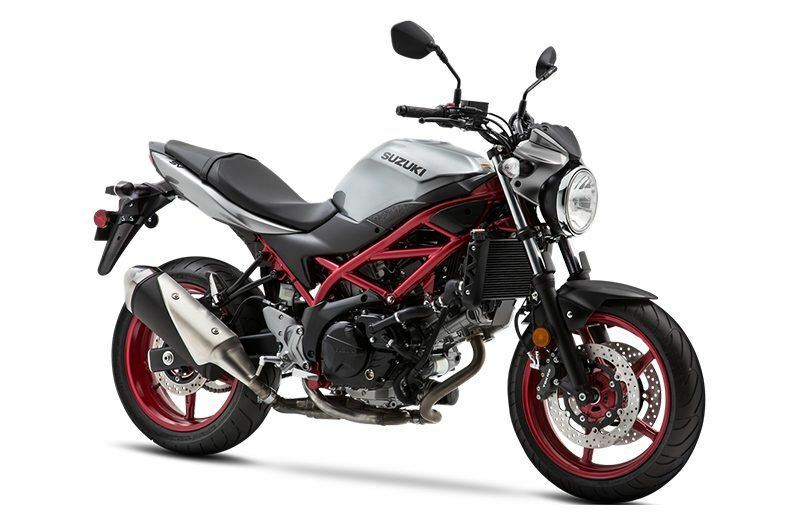 The SV650 also features Suzuki’s Easy Start System (which was first featured on the GSX-S1000) that lets the rider start the motorcycle with a momentary press of the start switch without pulling in the clutch lever when the transmission is in neutral. The air cleaner case design has high capacity and routes crankcase breather gas from the engine cover to help increase engine power. The air intake funnels have staggered lengths to heighten mid-range torque. The exhaust system has a clean, functional appearance and lower weight. The 2-into-1 system has a catalyzer to further reduce emissions. The location of the muffler and its brushed stainless steel cover are changed to allow greater lean angles when cornering. The high-efficiency radiator employs a large cooling fan for exceptional cooling capacity. To further control temperature, the engine is also fitted with a coolant-cooled oil cooler that is compact and lightweight. The close-ratio, six-speed transmission features carefully selected ratios that are equally well-suited for commuting or spirited riding. The multiplate clutch has precise push rod actuation of the pressure plate for a light pull and consistent release point. 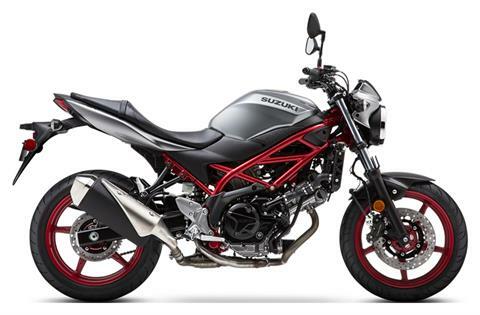 The SV650’s Metallic Oort Gray bodywork is complemented by an exposed red frame and cast aluminum wheels. Visually stunning, the red trellis-style frame is constructed of high-strength steel tubes so it contributes to the motorcycle’s low weight and trim chassis. The slim, gray bodywork is aesthetically pleasing while aiding comfort and maneuverability. The position of the muffler and its brushed stainless steel cover are changed to allow greater lean angles when cornering. Dual four-piston Tokico brake calipers up front grasp a pair of 290mm fully floating stainless steel rotors for great stopping performance. Liquid-cooled, 645cc, four-stroke, DOHC, 90-degree, L-twin engine has perfect primary balance so it smoothly pulls with authority from idle up to the 10,000 rpm redline. 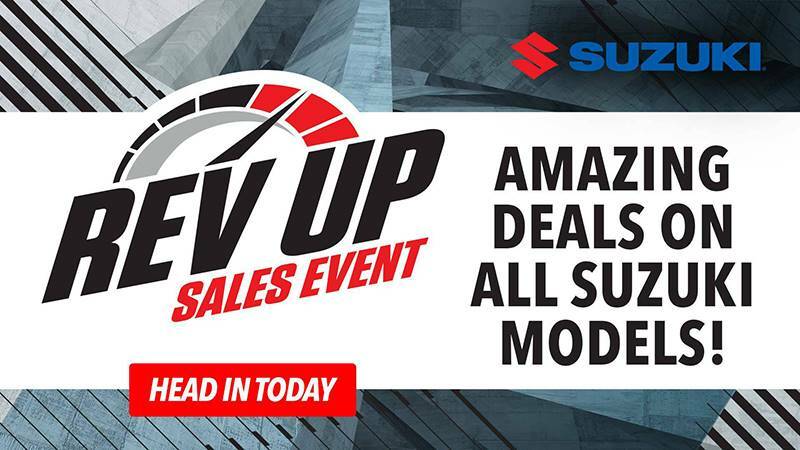 Advanced EFI system includes Suzuki’s Low RPM Assist feature that seamlessly adjusts engine speed during takeoff and low-speed running to smooth the power delivery and to help eliminate the possibility of the rider stalling the motorcycle.